Alison Holleworth is VPS’ Accounts Manager and May 2019 will mark her 3-year anniversary here. Initially working three mornings each week, Alison’s role has expanded and she is now in the VPS office daily from 8am to 4pm to give us rugby updates (and to deal with all the accounting requirements brought by our considerable growth). She also runs her own business with husband Shawn, Chesterfield Garage Equipment – which takes care of evenings and weekends! And on top of all that, Alison has been studying for AAT (The Association of Accounting Technicians) qualifications. Sheffield-born Alison began her career at HSBC before taking up a role in a solicitors’ accounts department. 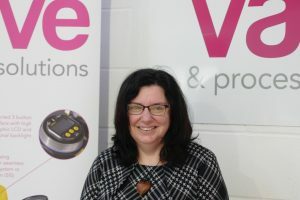 She and Shawn had run thriving Chesterfield Garage Equipment for 10 years when Alison joined VPS. It all started when Alison’s son Patrick was 10 and asked if he could play rugby. He’s now 23 and a PE Technician at a local secondary school; daughter Theresa, 19, is soon starting a career in the skies as an airline cabin crew team member.